It time to meet Monster 2, he just as mean as his older brother but he likes to get wet. That right; the Mamba Monster 2 ESC is now potted by the good people at Castle in Kansas City. Users can run their vehicles through the morning dew, down the muddy road, across the soggy snow or just about anywhere else youd be interested in running a 1/8th scale RC buggy or truck. Mamba Monster 2 is intended for on-road, buggies, truggies and monster trucks running up to 6S LiPo and tipping the scales at up to 15lbs. The innovative new case allows for fan changes, if necessary. Solder posts now permit users to change battery wire length and direction as needed. As always, the Mamba Monster 2 offers industry-leading software functions and USB programming capability via Castle Link USB adapter (free with included coupon). Remember, the fan is not water proof, so users need to remove the fan before they head out into wet conditions. 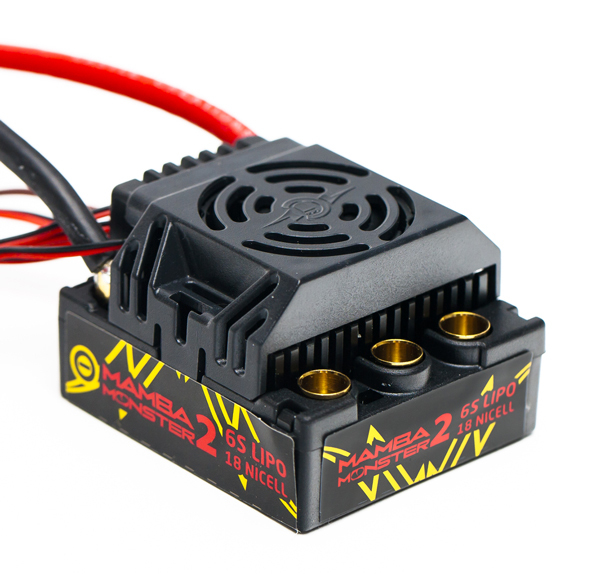 The Mamba Monster 2 delivers all of this while retaining the astonishing price of $199.00 The ultimate 1/8th scale ESC for power and versatility at an unbelievable price. Operating environment	Waterproof* design allows for use in nearly any environment. *Not intended for operation while submerged in liquid. If unit is operated in wet conditions, rinse with fresh water to remove dirt or corrosives, then fully dry unit. Fan is not water resistant. Remove fan from ESC before exposing vehicle to liquids.